WHO THE OLD MAN WAS ?? In 1946,he started for Shirdi with his wife and children to attend Guru Purnima. Rains were pouring in and near Shirdi.He took the evening train to Poona and reached Kopergoan around 2.30am,he knew none. Rains were pouring. He was helpless. Suddenly an old man came to him and asked him "What are you praying for? 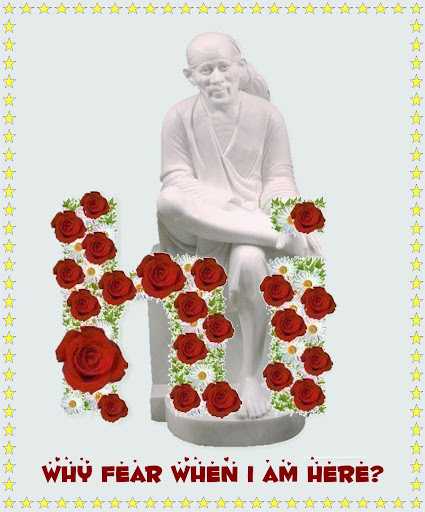 ", Kakade answered "I wish to go to Shirdi". The old man took him and his family and engaged a tonga to go to Shirdi and suddenly disappeared when Kakade got into the carriage. Kakade then turned to thank him but could find no trace of him. When the tonga reached Godavari, there was plenty of water in the river. The tonga driver did not wish to take the risk of crossing the river with occupants in it. Some other person appeared there and asked Kakade and wife to ford the river by walking. As for the two children the stranger carried them in his arms till the other bank was reached. The tonga stemmed the river freed from the human weight. Then Kakade turned to thank him but the stranger had left the children on the bank and disappeared." Beloved Readers, Baba confirms from the above incident "If you cast your burden on me, I shall surely bear it" Did not Baba Sai provide water to Chandorkar on harischandra hills in the guise of a Bhill? What is impossible for Omnipotent Sai? OM SAI SRI SAI JAYA JAYA SAI !! Page created in 0.293 seconds with 27 queries.